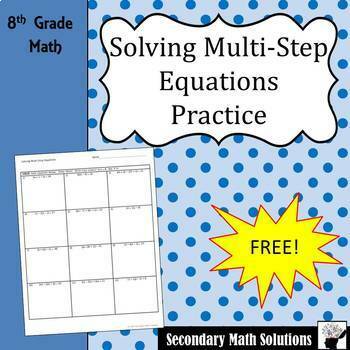 This is a one-sided practice page over Solving Multi-step Equations containing the distributive property and/or combining like terms. Great for cumulative review. 12 questions. Key included. This purchase is for one teacher and for classroom use only. All rights reserved. No part of this product may be reproduced, transmitted or distributed without express permission from the author. This product may not be posted or uploaded to the Internet in any form including classroom websites or network drives. If other teachers, colleagues, teams, schools or districts wish to use this resource, additional licenses must be purchased.